The Grand Central Market on Broadway in downtown Los Angeles is in the process of gentrification. You can now buy an egg sandwich for $13 or grass-fed beef for $35 a pound, but some of the old-line food stands are still there. Thank goodness. 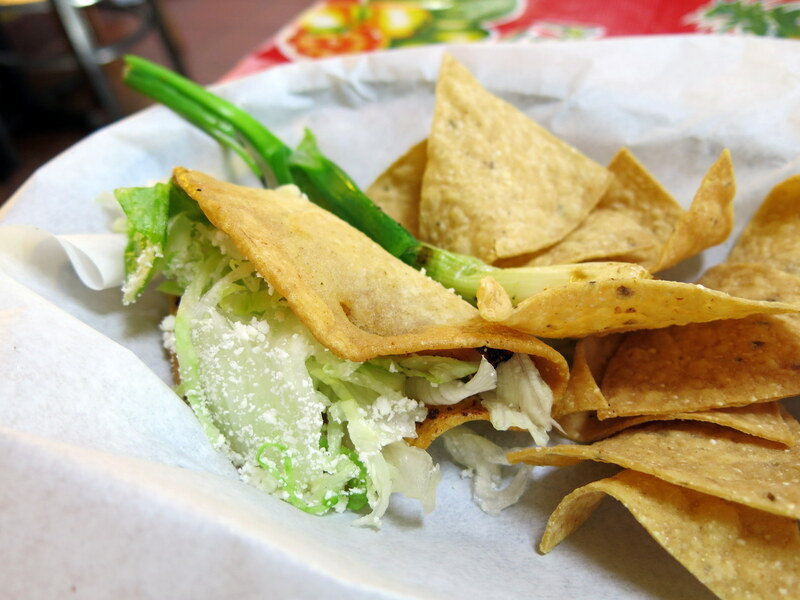 I recently stopped Lupita’s, and was pleased to find a classic Baja style fish taco. 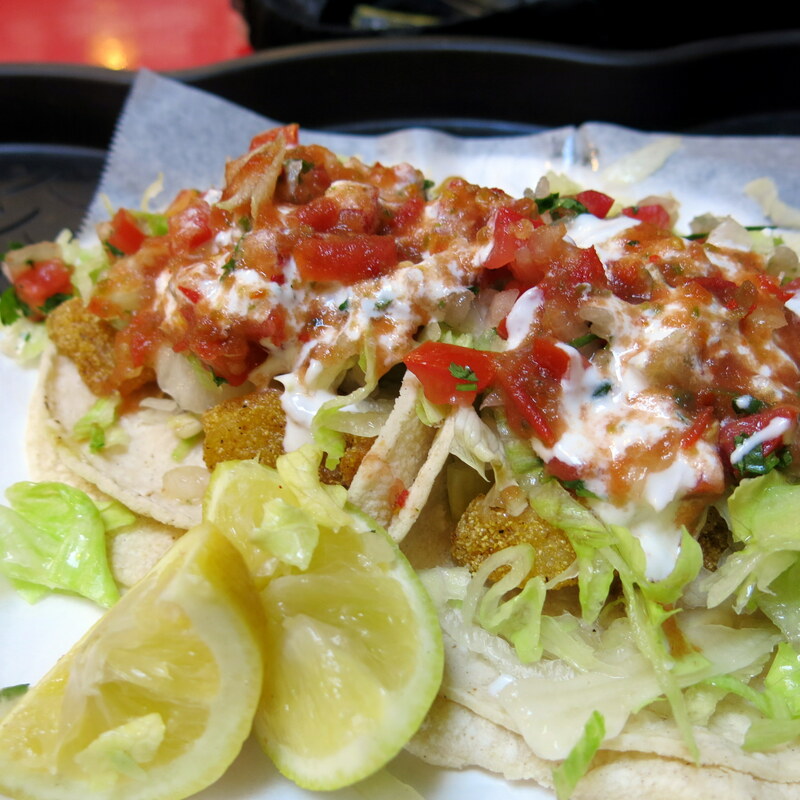 Perfectly fried fish fillets on warm tortillas, smothered in shredded lettuce, crema, pico de gallo and hot sauce, with a dash of squeezed lemon, they can be the perfect lunch. Let’s hope they don’t get forced out of the market by the trendy new places. 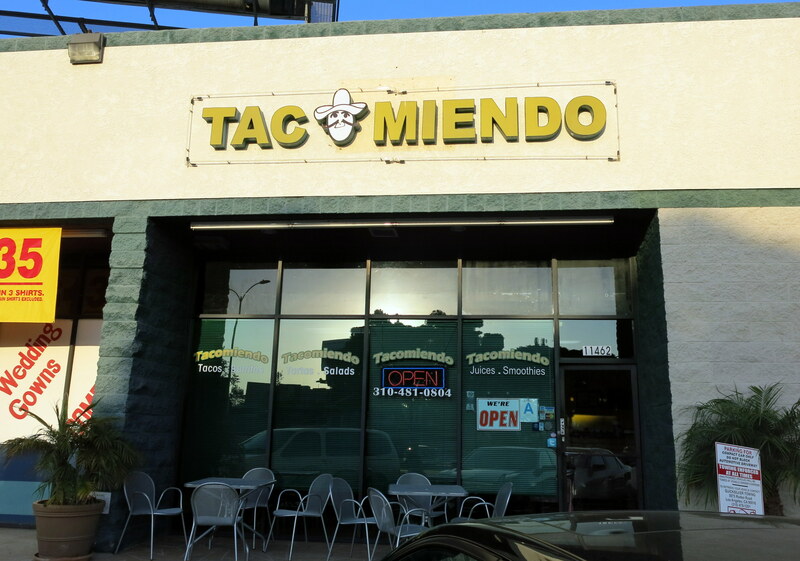 I recently saw an article in which Tacomiendo’s potato taco was ranked near the top of all tacos in the United States. 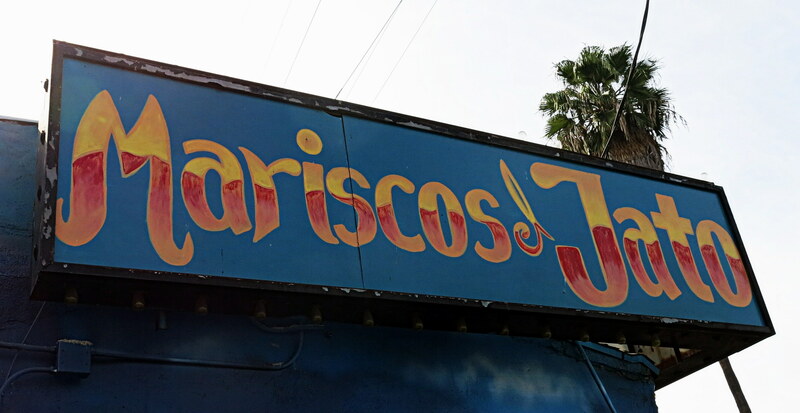 Located in a dreary West Los Angeles (not a notorious hot-bed of Mexican food!) strip shopping center, located between a dry-cleaner and a car repair shop, I had my doubts. In fact, I condescendingly assumed the writer had never had a potato taco before, and once he (or she) experienced the magical combination of mashed potatoes and crispy fried tortillas, declared it to be the best in the country. Today I tried it for myself, and haven’t changed my mind about the reviewer’s experience level. Don’t get me wrong – it was a perfectly presented, extremely tasty potato taco, and I will certainly order it again, but it’s not noteworthy on a national level. What I found more interesting was an item called a Chancla. While I stood in line, I looked it up on the internet, and learned that it seems to come from the Puebla region south of Mexico City, and that it is widely subject to interpretation. A chancla is a flip-flop sandal, and what I received did resemble footwear in way. It was beautifully fried masa stuffed with black bean paste, sort of a larger version of a Salvadoran pupusa. 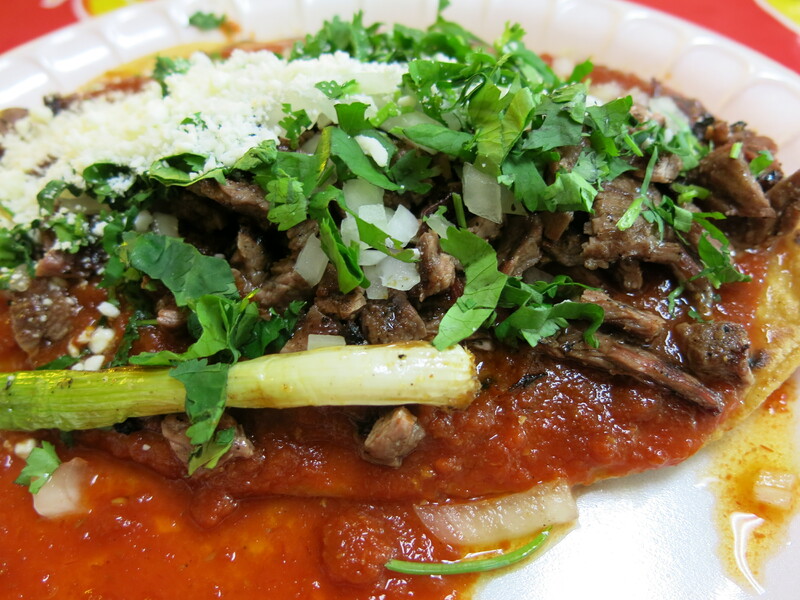 It was covered with a spicy red salsa, and topped with carne asada, cilantro and crumbled cheese. It was sort of a pizza experience, but very, very Mexican… and very, very tasty. I spotted this East LA seafood restaurant on a Sunday afternoon a couple of months ago. The reason I noticed it was the large number of customers, but that was the very reason that kept me from trying it that day. They were just too busy. I was in the neighborhood today, and had much better luck. 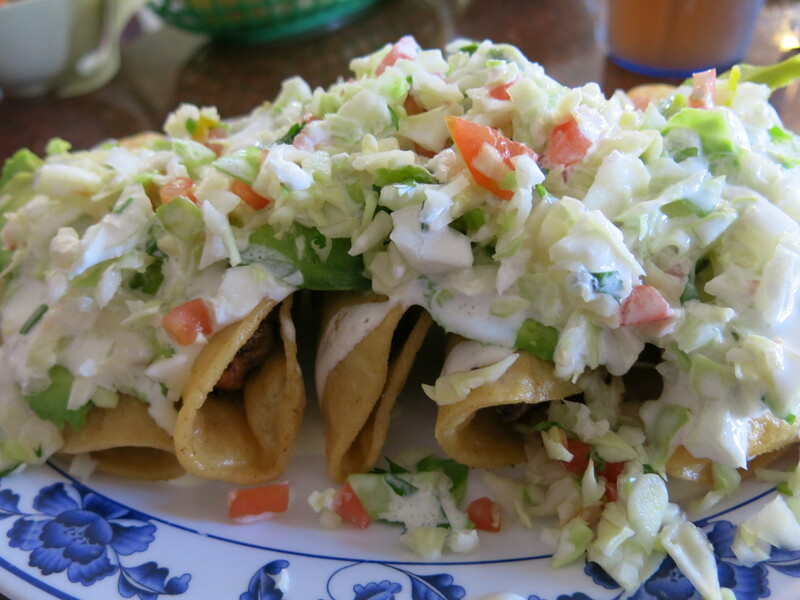 The menu has photos of the food, and my mind was made up the moment I saw the 5 Tacos de Camarón con Ensalada. It turned out to be 5 huge tacos buried under slices of avocado and a sour cream cole slaw. The tacos were filled with grilled shrimp that seemed to be lightly breaded, and a dash of pico de gallo, fried until they were crispy. I rarely encounter a crunchy taco, but the robust combination of seafood flavor, textures and even the warm and cool temperatures delivered on the promise I had seen in the photo. I spoke with the owner, El Jato himself, a friendly, outgoing native of San Juan de los Lagos, Jalisco, near Guadalajara. He told me that he created most of the dishes on the menu, and all of the plates I saw whizzing past me looked delicious. 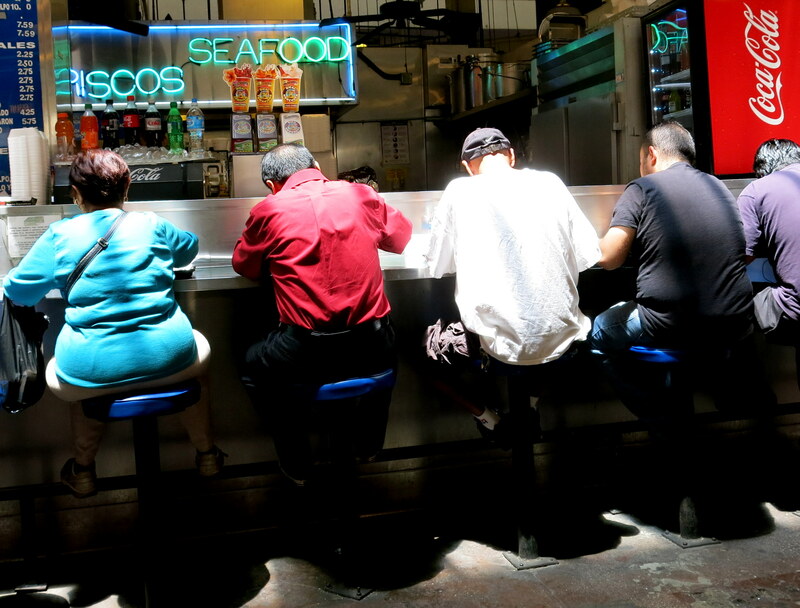 I saw beautiful tilapia fried whole, gigantic fish tacos, and big seafood-cocktailish looking dishes called chavelas. So there are at least three more visits in my future, before I go for a repeat on the shrimp tacos. 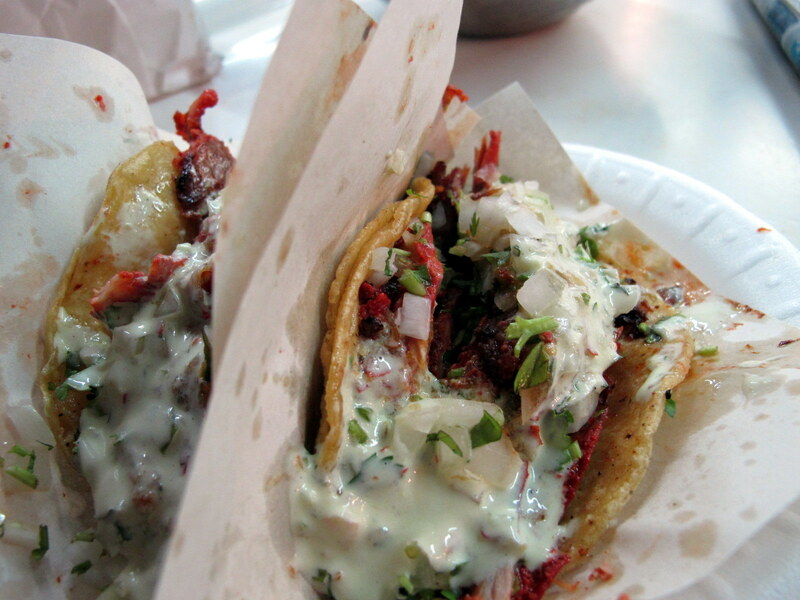 The LA Weekly magazine tells me it’s National Taco Day, and they list their 20 favorite tacos in Los Angeles. 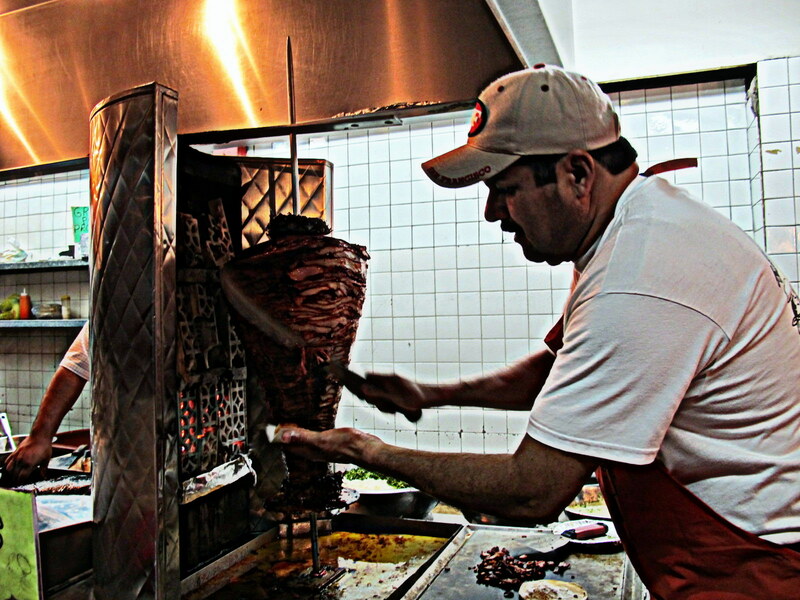 I’ve only had 7 of them – many of the establishments are trucks – but from what I can tell, these guys really know their tacos. Meanwhile, here are a few recent favorites of mine… unfortunately not in Los Angeles. 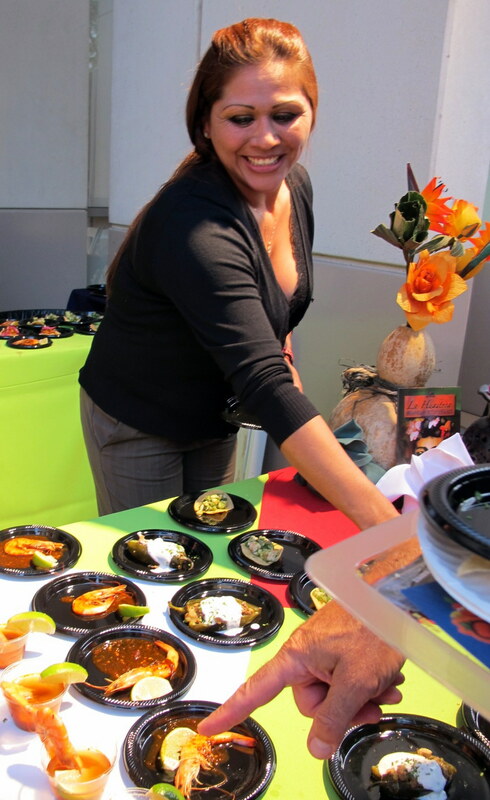 Some years ago, I was telling a friend about my passion for the wonderful tacos I was discovering all over Los Angeles. When he told me he didn’t like tacos because he didn’t like the hard, toasted tortillas they came on, I was mystified. I had never heard of a taco with a hard shell. Later, I learned that some of the old-school taco places in LA serve them that way, to appeal to unsophisticated American tastes. I guess they’re tasty enough in their own right, but they are NOT the real thing. 1. If the beans on that combo plate you ordered are covered in triangles of yellow cheese or the grated four cheese blend you can get at your corner market, you won’t find it south of the border. I have never seen a Mexican variety of yellow cheese. Cheese in Mexico is usually white and if it is served on beans, tends to the crumbly queso fresco type. 2. 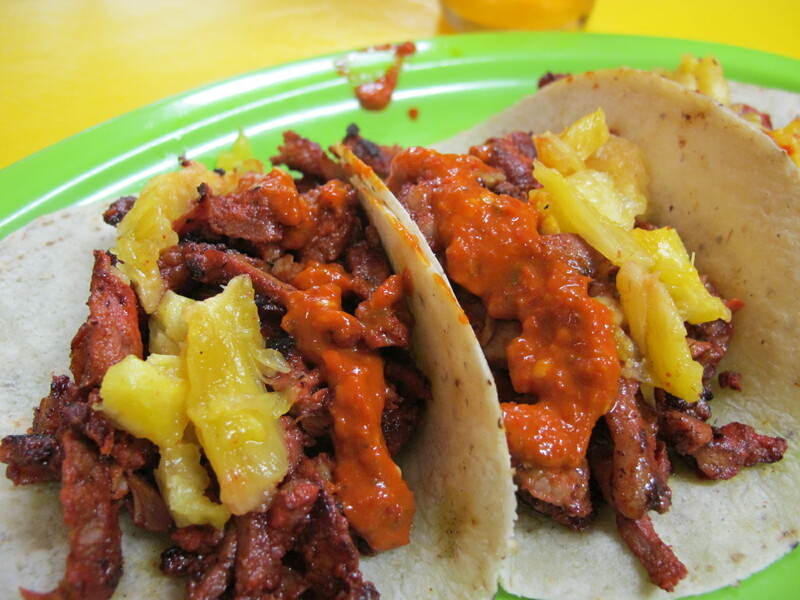 If your tacos come with any of the following, ground beef, lettuce, tomato slices, grated cheese, yellow wax paper or even turkey, you are not in Mexico. 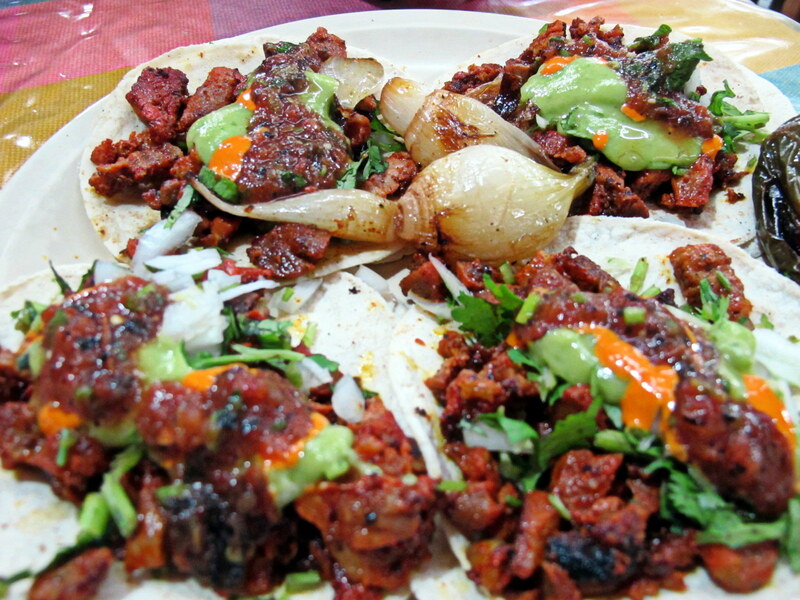 Tacos come with onions and cilantro in Mexico. They are also made with steak and all the other parts of the cow or pig, but never have I seen a taco filled with ground beef. 3. If you can order shrimp, chicken, steak or any other type of fajitas, you won’t be finding that plate in too many taco stands or restaurants in Mexico. Sorry folks, as wonderful as fajitas can be, I’ve never seen fajitas in Mexico. 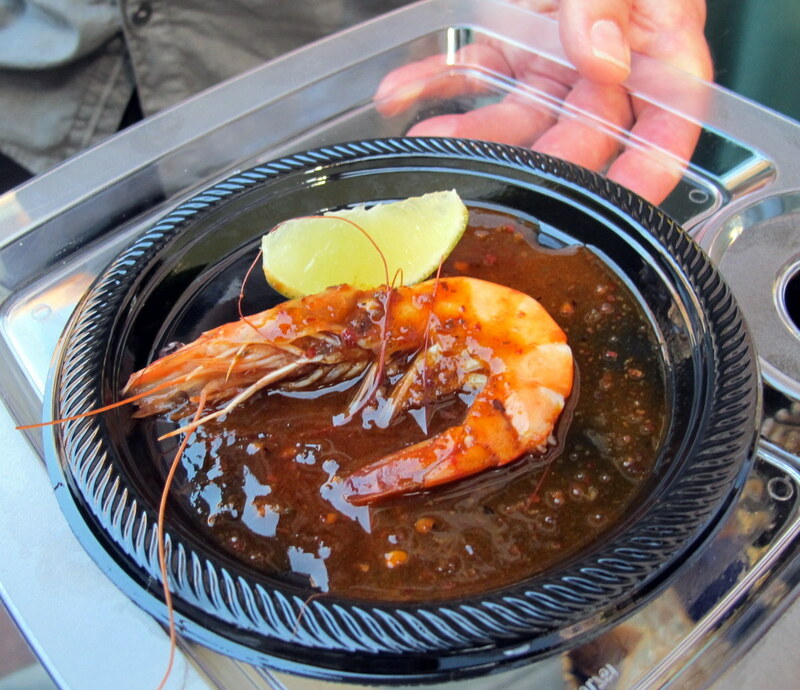 I’m sure they are served somewhere in that great country, but this is a dish popularized by the Orange County restaurant chain El Torito in the 1980’s. 4. When you ask for salsa and the spiciest option you get is Amor or Tapatio bottled sauce, you certainly are not ordering your food in Guadalajara. In Mexico, we love our chiles. Habañeros, jalapeños, serranos and chiles de agua, we love them all, and expect to experience these tastes in, and on our food. Unfortunately, the American palette is not ready for this type of experience so we mostly get a tomato blend spiced up with a little bit of pepper. 5. Finally, when you walk in the door, if the first thing that greets you is a wall of sombreros or a chile in a beach chair, you can bet you’re gonna get a lot of that yellow cheese covered stuff. The derivative here is that if you see folks getting drunk wearing mariachi hats and dancing like loons, you are more likely in Papas-n-Beer or On the Border than a traditional Mexican restaurant. I was tired when I arrived in Guadalajara after a surprisingly long bus ride from Puerto Vallarta (they look so close on the map) so I guess my negotiating skills weren’t at their peak. All the internet reviews I saw for Hotel Casino Plaza were excellent, and I figured I could persuade them to come down on their rate, which was a bit higher than my budget called for. I used all my most persuasive techniques, but they just wouldn’t drop the rate. Rather than go to the trouble of finding another hotel, I gave in, and registered. What I got was a lovely, modern room in a first class hotel for a little under $50.00… Great value! The hotel is within easy walking distance of the famous cathedrals and parks in the downtown historic district, and the staff couldn’t have been more pleasant and helpful. 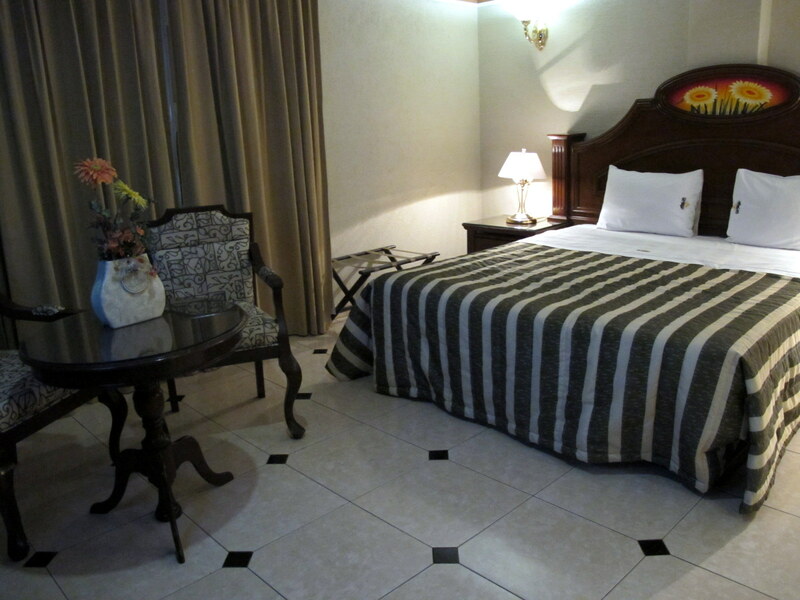 There’s no question that I’ll be staying here on my next visit to Guadalajara.